Quick Update: This model has been replaced. Partly by the ‘TT’ and ‘Nevada’ lines (compact styles) and partly by some amazing new multi-station configurations! These look amazing, and with BH Fitness’ rep for quality they are as close to a commercial unit as you’ll ever find for home use. Check out this dedicated search page for the latest BH Fitness Multi-Gym options now! Summary: For the ultimate home workout, the BH Fitness Global Multi Gym is ideal – combining a full multi-gym with built in leg press. When you see the gallery for this gym, and read the (all 5-star) user feedback, I’m confident this will reach the shortlist of home gym users of all fitness levels. Check out the product page (removed) for the latest offer and to see that amazing picture gallery. 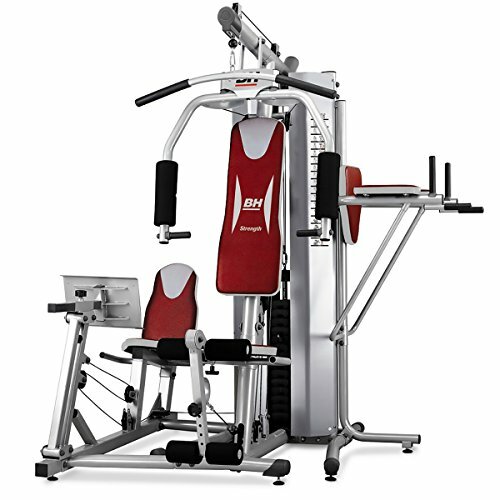 The BH Fitness Global Multi Gym is the flagship home gym machine of the range, with distinctive features including the dip and leg raise tower and the adjustable leg press station. It features high and low pulleys, a chest press and a pec dec, while the 100kg solid vinyl weight stack is ideal for that progressive training. This mid to high price range machine also promises the ultimate in stability, due to the wider ground area and the multiple points of floor contact. You’ll find the vinyl weight stack at the rear of the machine, this shrouded for safety. There are eleven plates in all, the weights ranging from just 18lbs with plate A in place, while all of the plates will give the maximum resistance of 220lbs (100kg). The equipment uses high tensile 2000lb aircraft cables that are guided through a series of pulleys, ensuring a particularly smooth experience with the home gym. There are a number of home gyms which can be purchased at a lower price, but with this machine you are certainly paying for quality. The equipment is highly stable, extremely smooth and offers a wider range of weight variation than you might find elsewhere. The equipment looks great too, with an eye-catching black, grey and red colour scheme. With floor dimensions of just 174cm by 200cm, this is ideal for both homes and garages. There are several reviews of this item, but each one awards the equipment the maximum five out of five stars. It has been described as both excellent and fantastic, well worth the money and money well spent (i’m sure you can see the pattern here!). The instructions were also said to be great and has a good solid frame for all round exercise. When buying gym equipment it can pay to spend a little more upfront for a high quality piece of equipment and this is certainly the case here. This home gym is stable, smooth and is built to last. Check out the latest multi-gym options from BH Fitness on this amazon.co.uk dedicated page!